SWEAT begins to form on the brow, goose bumps shiver up the arm - fear has settled across the backyard. The wild, long grass covered hill looms like Mount Everest, with dangers lurking for any careless climber. The engine roars to life, the mower creeps up the bank, tilting further and further on its side until the driver is leaning off the side just to keep it balanced. Suddenly, the front tyre slips, the machine begins to roll and tipping point, the moment every mower dreads, is reached. But it didn't have to be like this - not if the driver had a Spider mower. 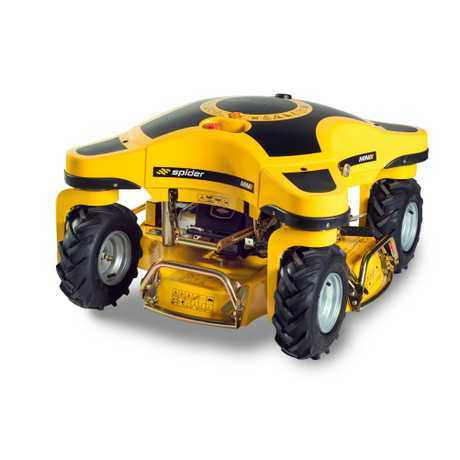 The remote-controlled machine is transforming the way Australians take the stress out of maintaining potential dangerous properties. The Czech Republic built machine combines the cutting power of a 9.5 Briggs & Stratton horsepower engine with a 22-inch cutting deck and is as easy as sitting on the back veranda, remote control in hand and letting the Spider do all the work. "The bigger machines are generally used in commercial applications for roadside maintenance or dam walls, reservoirs," Spider product manager Glenn Dwyer told Seniors News. "The residential machine (the Mini Spider) does up to a 30-degree slope with a range of 100 metres on the remote control, which is powered by double AA batteries." But the main feature of the Spider is the near-extinguish of danger to the owner who has risked life and limb on dangerous slopes. "We have elderly customers that have the mini at the moment who basically live on large acreages that have a lot of slope," Dwyer said. "They're just getting too long in the tooth to be doing any daredevil, hanging off ride-on manoeuvres. "And that's the main thing, to remove the operator from the danger of a roll over on a slope." The Mini features a kill-switch on both the remote and mower, is easy to flip over in the case of spill, has a battery life of over three weeks and, best of all, is easy to set up on delivery. "In fact, I had a customer purchase one recently, sight unseen, over the phone," Dwyer said. "Basically we delivered the machine by courier and when it got there, he rang and I talked him through the process and he hasn't looked back." And the price - the Mini retails at $13,500 with GST - will easily make anyone buying a new mower think twice. "The only other way to do a slope on a customer's property anywhere near the angle this machine can do, you would need a 4WD ride-on at least," Dwyer said. "Which you are still sitting on, and that will set you back around $18,000. "From a cost perspective it's pretty good."